PLANET OF THE DOLLS: I'm Baaa-aaack! Well I'm back from Texas. I got back very late the Thursday night before last. With the flight delay from Atlanta to Columbus it was actually very early Friday when I got in. In spite of my Texas friend's suspicions,I managed to stay awake the whole way home. I was trying to go to sleep, but I'm not good at sleeping on public transport. I suppose I should remind everyone how I came to have a friend in Texas. Many years ago,boys and girls,when there was no internet, people had things called 'pen pals'. Lisa had become my penpal somewhere in the early 80's,sometime before 1984 probably. We shared several interests,and a sense of humour. 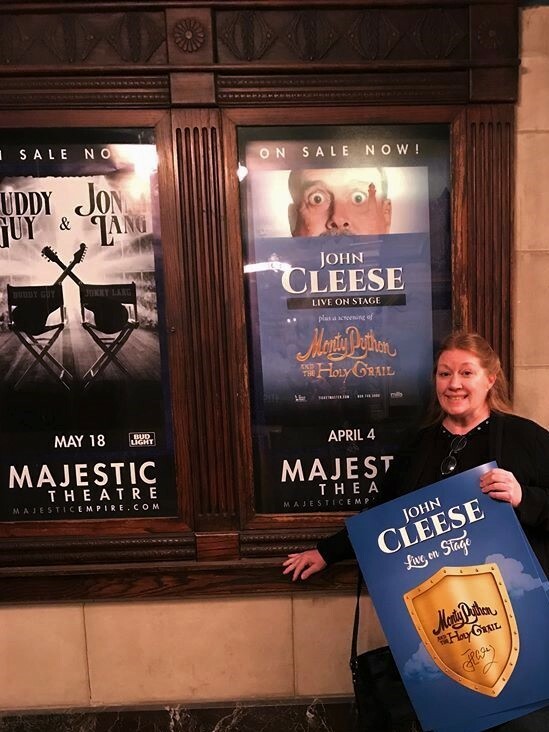 Both of us loved Monty Python.In fact, this visit came about because Lisa was going to see John Cleese and wanted me to come and go with her. Finally,in 1988 I went to visit Lisa and we finally met,and in person our relationship was just as good as through the mail. Me, on the left, and Lisa,in 1988. For people who had never met,we had a pretty tight friendship. We talked on the phone, wrote extremely long letters and traded photos, gifts, and articles of interest. When I went to England in 1986 to stay for a few months, Lisa trusted me enough to send along some money so I could pick up some books and records for her while I was there. That's before we had even met, remember. Don't do that with people you meet on the internet! While I was in England Lisa and my dad were the only people who wrote to me on a frequent and regular basis. I married Ken in 1989. Our first vacation as a married couple was the next summer. We went to my mother's side of the family's reunion,and then traveled on to see Lisa. The next time we saw Lisa, we had three year old Emma with us. That was 1994. After that we had another baby,bought our house,and Ken changed jobs and no longer got paid vacations. 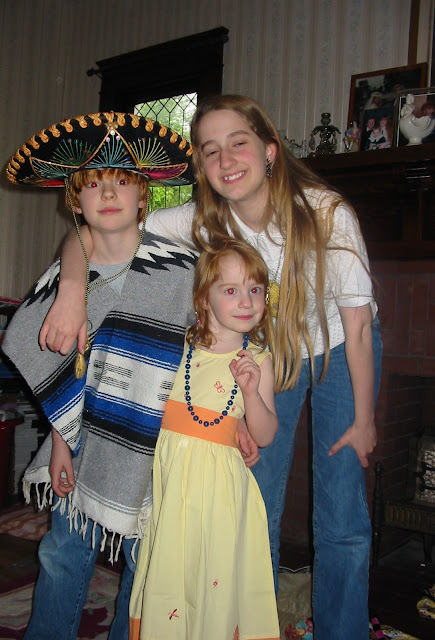 We took vacations in the intervening years, but they were usually shorter. It takes a while to drive to Texas from Ohio! With three kids,the cost of flying was out. So consequently I hadn't been back to see Lisa for almost 24 years. Too long. I arrived in Texas on Saturday evening. I haven't flown by myself since,oddly enough, the first time I went to see Lisa, in 1988! Back then your party could meet you at the gate as you got off the plane. Nowdays they could be anywhere. As I excited the gate it occurred to me that I hadn't arranged where to meet with Lisa once I was there. I wandered down to the gate-free part of the airport and asked somebody where people meet up with their people when exiting the plane. I was directed to the lobby-ish area, or outside where the cars were picking up and dropping off. I stuck my head out the door, but the air was so hot and muggy I decided she wouldn't be waiting out there! I came back in and Lisa spotted me from way down the airport and waved. Thank goodness, because I wasn't sure it was her at first. We had a nice reunion and headed out to get some dinner, once we found our way out of the airport! Lisa had scolded me in 1988 for wanting sour cream with my Mexican food because 'real Mexicans don't eat sour cream',(I explained that,that may be so, but I'm not Mexican and I like it. ),but I noticed that everywhere we had Mexican food this time, they served sour cream with it. Tammy World was relieved to get out of the case and relax on Lisa's bed,which was turned over to me for my visit. Sunday was Easter. I didn't realize I was going to be away for Easter until Emma pointed it out after my flight was booked. Lisa and I hung around the house all day and talked ourselves into exhaustion. The next day we headed for Boerne,a small town near San Antonio,full of antique and gift shops. The architecture is definitely different than Ohio. Of course, that day, during which we did a good deal of walking, the temperature was in the 80's. It was cooler the rest of the week. It figures! Tammy World hanging out in Boerne with Wild Bill Hickok. Lisa can't get a reaction from Wild Bill. Texas is full of grackles, these loud beaked birds with freaky eyes. 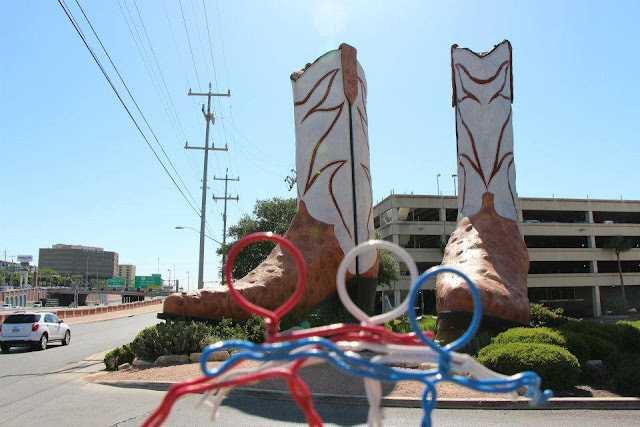 Unfortunately, we were there on a Monday, and a great deal of Boerne is closed on Monday! We couldn't find anywhere we wanted to eat that wasn't closed. except for the ice cream shop! I did do some shopping and bought myself a Christmas ornament, as I like to do on trips. My Christmas ornament from Boerne. I also bought this little accordion,which will belong to Tammy World's nerdy brother Simon, and be displayed in my 1/6 scale dollhouse when I get it running again. I was looking for a mini rug. I finally found this one. I finally found an affordable opal ring for Ivy too.I've been looking for one for ages. Emma has a thing about artichokes,so I got her a blown glass artichoke ornament from the store where I bought the accordion and the swan. Lisa and I ended up leaving Boerne to seek dinner. We ate at Los Palapas,a restaurant up on a tall hill. The food was good. I had the Garfield High Quesadilla. I have no idea why it's called that. ...and Lisa got the idea to take me to the bulk crafts supply/party store to buy miniature things. So the next day we headed for there, and I got these little guys in quantity,in hopes of reselling to help finance part of my trip to Texas. I got doubles of some colours. They're slightly smaller than the one Lisa's mom gave me. I got a couple of larger ones too. And another set of maracas. These things really rattle when they're shaken. I got some little cowboy hats for selling. These are dollhouse scale. And these sombreros are too. But Tammy World got a couple of sombreros that are just her size. There is this one. And if she wants to be more dressy, there's this one. I chose this one because it reminds me of the one Lisa sent Fuzzy for his fourth birthday,when he was going through his Zorro obsession. Fuzzy,Ivy, and Emma,years after Lisa sent Fuzz the sombrero and the serape. He really liked them. These little skeleton people are cute. I found them at the same place. By the way, the full size blanket Tammy has been posing on here was bought at the same place too. Ivy has an obsession with blankets. She got this purple one. I bought one for Fuzzy too. We also went downtown to the market where there were loads of goodies. I was so busy shopping I forgot to take any pictures! I did manage to find the good candied pumpkin candy I remember from previous trips to Texas. These little guys were kind of irresistible. There was one stall that had tons of really tiny stuff. Lisa spotted it for me. We had a good meal at a very colourful restaurant called Mi Tierra,which was right across he courtyard from the market. It was full of very brightly coloured decorations, some of which,upon closer inspection, I realized were Christmas trees! It was very pretty in there though. While we were there Lisa's mom texted her to say there was a big storm moving in, with hail expected. Lisa was worried about getting home before it hit. However, she spotted a shop in the market that was still open, and she decided I needed to go there. The shopkeeper had the tv on,so we were able to find out more about the storm. Apparently there were tornadoes and flooding in Ohio! The news said it was all south of Columbus, so I knew home and Emma were ok, but Lisa insisted we call Ivy. Ivy was one the couch,ensconced in blankets and under our cat Mow, who was sleeping on her. She said there had been rain, but not even heavy thunderstorms. So at least we could relax. As it turned out, it was a good thing we went to that shop, because, although we got there minutes before it closed, I managed to find these! Little tiny ceramic tiles! They're about 1" square. I bought a bunch in hopes of selling off my extras. (But I'm definitely keeping some!) So these babies are for sale people! These are sharper than they look. My camera didn't focus well. Maybe if I do well with the stuff I bought, I can afford to visit Lisa again in less than 24 years! Wednesday we had some errands to run. Tammy hung out in Lisa's cup holder. It was a perfect fit. On a stop to the mall to pick up some books,I got a chance to check out the yucca plants. We don't have yucca plants in Ohio,where, by the way, it's STILL snowing on a fairly regular basis. They get HUGE. 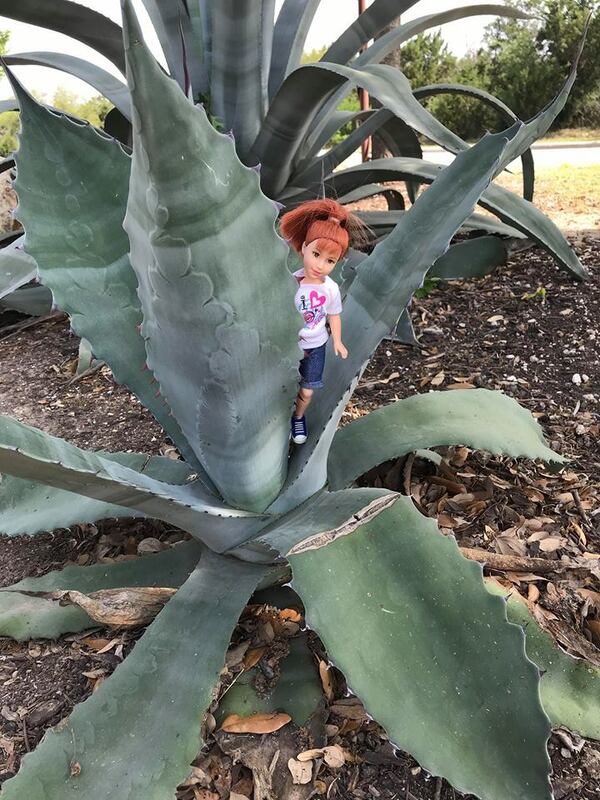 Tammy World showing the amazing size of the yucca plants. Lisa is a great friend.When I introduced her to Tammy World,who was to act as my alter ego so I wouldn't have to use pictures of myself in my blog post on my trip,instead of just thinking I had lost it over the years, she joined in! She frequently suggested picture ideas for Tammy and said,"We should have taken a picture of Tammy..." here or there or with blah blah. Lisa compared my awkwardness about photographing Tammy in public to her own experiences photographing some little wire people called Wire Dudes,by an artist called Late Blooma. The Wire Dudes do San Antonio. We also saw these red flowers,which even Lisa wasn't sure of the name of. Turns out, it's red yucca. This stuff was more recognizable to me. I've seen this stuff in old Westerns and cartoons,and probably previous trips to Texas,although I don't remember. What I didn't realize is that it,at least this variety, grows out of what looks like a log. The older cactus growth is really hard and looks like wood. After finishing our errands we stopped to eat,again, at Los Palapas. There were more of those evil eyed grackles. This time they were outside and we were inside, so we couldn't hear their loud voices. From Los Palapas we went back to Lisa's to change for the big evening out we had planned. Remember,my trip got started in the first place because Lisa wanted me to go with her to this event. 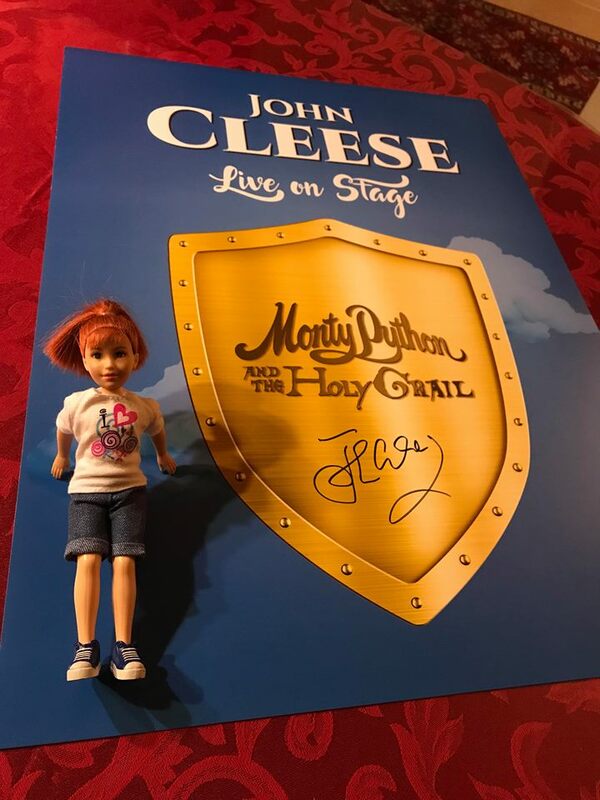 So that evening we went to a showing of Monty Python and the Holy Grail, after which there was a question and answer session with John Cleese. Just about everybody in the audience knew every line of the movie, but we still found it funny. Afterward,John Cleese was accompanied on stage by his daughter Camilla. He answered questions and talked for about an hour and a half and was very funny. Afterward we found out there was a meet and greet! Tickets had to have been purchased prior to the show,so we couldn't do it then. If we had known, we would have gotten meet and greet tickets! 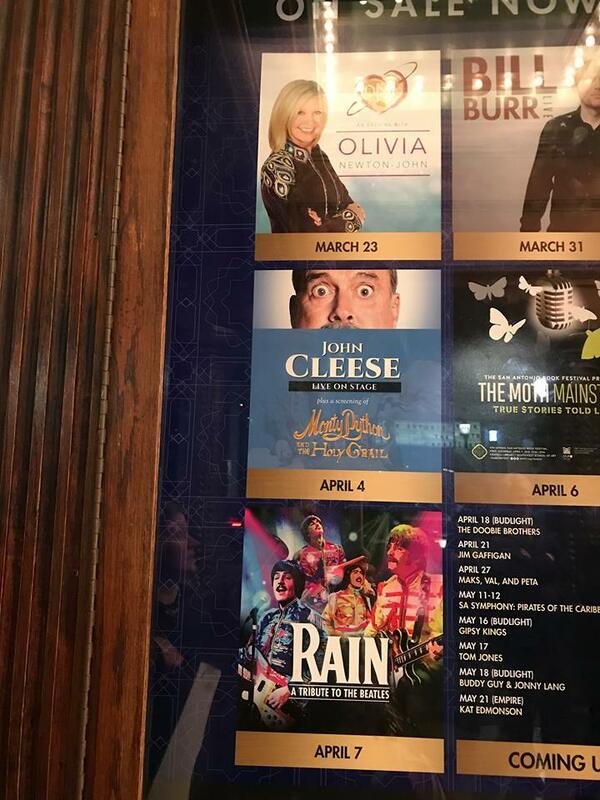 Meeting John Cleese together would have been something really fitting and special. We were wondering if there would be merchandise. I thought there wouldn't be, but there was. It was all expensive because almost all of it was signed. I wasn't willing to pump out that much money for a signed item. I was pushing it flying to Texas. Besides, I met John Cleese years ago at a radio show in London and got an autograph. John Cleese outside the BBC Light Entertainment studios in 1985,after the radio show. But where's my signed ticket?! Lisa and I also both wrote to the Monty Python office in the early 80's and we were sent pictures signed by the whole troupe. Like this one I photographed on the wall of the Python office in 1986. ... and sticker they happened to have laying around. When I went back in 1986 I took an 8"X10" of one of my photos, taken in the office the year before,(a photo of the boxes used in the Whizzo Candy sketch in the Hollywood Bowl shows.They were sitting on the windowsill as decoration.). This is the original. Everybody wondered why I wanted that signed. Well, because I took it, and I thought it was a pretty good photo too. As for the signed one, I really need to stop putting things in 'a safe place'. I kept the signed one in a frame for years, and then in my "Life Goes to the Movies" book for years. Then a couple of years ago I decided it needed to be put away in a safer place,and now I can't find it! I was allowed to leave the photo at the office, and the employees promised to have the Pythons sign it. (It took months, since Graham Chapman seldom came to the office. Everybody else signed it almost right away. Eric Idle even signed it twice.) I was paranoid something would happen to it. I checked on it a couple of times while I was in London.The office employees promised to make sure Graham would sign it, and they would mail it to me. In the end I went back to America without it. I was nervous, but in the end I'm glad I left it,since Graham died only three years later. I found it! I tried to think where the most logical place for me to have moved it to would be. For a change I did the most logical thing! Look where it was! It was in this book! That actually makes sense! 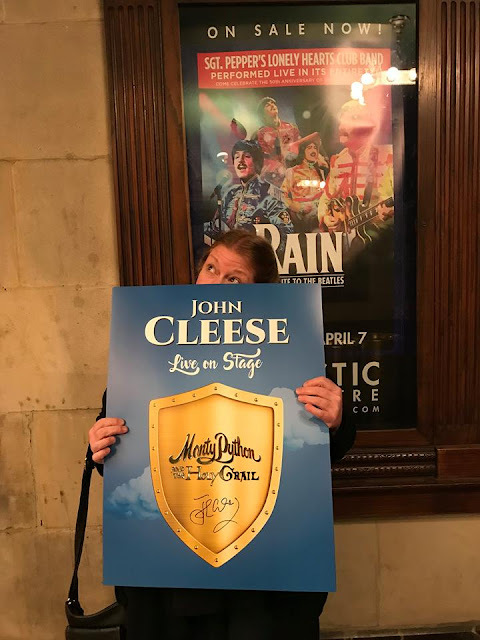 So I didn't have need of another autograph, although I might have bought a signed poster if I had been loaded with cash. As it was, I bought an unsigned one. We chased down about a half dozen people,(We were sent from one to the next one to the next one. ),trying to see if we could get the poster in the display,only to find out it gets sent back where it came from. Lisa bought a signed one though. Back at Lisa's house, we photographed Tammy with the poster. Lisa got a better shot than I did, so this is hers! The next day I had to leave, but not until evening. Luckily I had packed all my stuff the night before. It was a challenge, because I had come with only a small bag, squeezed down even smaller to make it the size of a 'personal item',and an extra bag to be my 'personal item' on the way home, when my original 'personal item' bag would be stretched out into almost 'carry on' size. (Phew!) My stuff still had to be fitted in like the pieces of a jigsaw puzzle to get it all squeezed in. So the day was spent hanging out with Lisa and her mom, and taking photos. This is Jasper, who wasn't particularly interested in having his photo taken. Lisa and I always took a photo together on the last day of my visit. We made sure we got a photo this time too. Find a hairdo that works and stick with it...or at least one that's easy. I told you I don't do hairdos. Lisa and I ended the day with a meal at The Olive Garden. I knew Ken would react with,"You went all the way to Texas and ate at the Olive Garden?!" Hey, we ate at Mexican restaurants the rest of the week,plus Lisa's mom made homemade enchiladas one day,(I did really miss the homemade tortillas Lisa's mom used to make. They were delicious! ),so it's not like I ate the way I do at home all the time. Besides, I cheated a little and drank Pepsi, which I have given up,(except for the hard to find clear kind),since it was reported that the caramel colouring gives you cancer. Lisa was on a vacation too,since she took the week off work,and she wanted to eat at The Olive Garden and have some pasta,which she doesn't eat much of any more. Besides, I love The Olive Garden! Lisa took me to the airport and we said goodbye. Who knows how long it will be until we see each other again? I just hope it's not 24 years this time! LOL, find a hairdo that works and stick with it! I need to add that to my favorite quotes! Shucks, do you not have grackles in Ohio? I thought those danged things were everywhere. They're noisy birds, but they're not out for blood like our mockingbirds are...Lordy, do I get sick of mockingbirds. Please tell Lisa for me that her wire men are epic and that she took a darn good picture of your doll with that yucca plant. No grackles in Ohio. 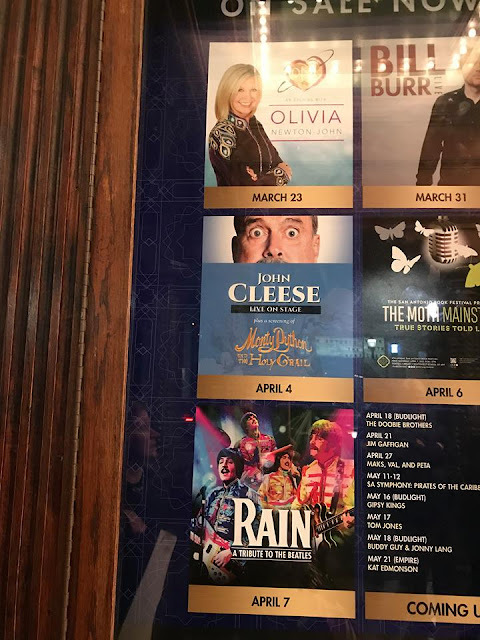 We have crows and blackbirds,but they have much less evil eyes!She did do a good job on the photo,and the one of Tammy with the Cleese poster too. It was very nice to read about your trip. I Love all the miniatures! Stumbled across your blog while doing a little research on Barbie dolls from my misspent childhood (late 1960s/early 70s)...and then found this current entry. Wow, what a sweet friendship you two have and British comedy lovers, too! Thanks for sharing some really cool memories - I can definitely relate. Wishing you many more hilarious adventures with your lifelong friend. Yes,in the early to mid 90's we lived about 45 minutes from Columbus. I know of CD101,but I don't know of your friend. I was raising little kids then so my music listening was heavy on Disney songs in those days! Oh my goodness what a wonderful trip! It really looks like you had a great time. Funny but we have those birds and the same plant-life here in southern Spain! I love the little tiles, and the other miniatures that you brought home with you. Thanks for sharing your trip with us, I really enjoyed it! Let's hope it definitely isn't another 24 years before you visit with your friend again. I'm glad you enjoyed it! You have grackles? And cactus too. Of course, it's warm in Spain,but not so much in Ohio! I would think you would have the little tiles there too,don't you? Isn't there a lot of tiled house decor in Spain? Well I didn't now they were called grackles but they look very much the same, they make a very strange cry and they chase the green parrots (Monks Parakeets and Quacker Parrots) and, I'm assuming, try to get their young from the parrots nests. And they are black but I've not seen one up close to see if they have those eyes. I thought they were some sort of large crow or raven, but they certainly sound very similar to what you saw. As for the tiles, I've not seen any like that here in that tiny size but we have lots very similar in the regular size, approx 6 by 6 inches or thereabouts, because yes we have lots of tiles in our houses here. Whatever they're called, that sounds just like what Lisa told me about grackles. She said they chase other birds away and steal the chicks. Those grackles have long tails that have a sort of fan shape at the end.Maybe your birds are relatives.Close enough,right? It must be wonderful having wild parrots to watch.The tiny tiles are hard to find. I bet there is somewhere there that makes them, with the regular ones being so common. The ones I bought actually came from Mexico. The shopkeeper told us the town, but we both forgot what it was!